What is the Best Hashtag Tracker for Social Media? When you have a key event, product launch or other content that can trend as a hashtag on social media, you want to track it and interact with those who use the hashtag or keyword on your behalf. For this type of tracking, we love the Keyhole.co (Yes. that’s dot co not dot com). Keyhole allows you to track hashtags, @account, keywords, @mentions, and use of a URL. It lets you better measure your social media marketing in regards to hashtag tracking. In this case, we are tracking an event hashtag for a church that is a great client. They are doing an event called Serve Day, where over 2,000 volunteers go out to tackle every code violation in the city and more! Entering the hashtag to track is as easy as typing it into the white box. You can have hashtags tracked on both Instagram and Twitter. For many of the other trackable functions, Facebook and YouTube can be included, just not for hashtags. 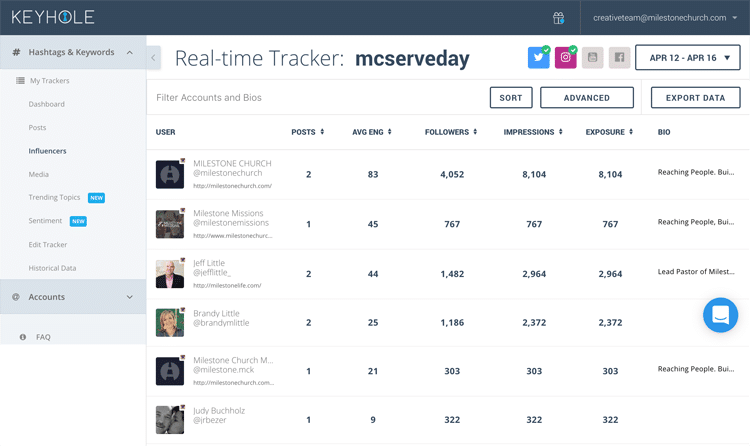 We carefully publicized the #mcserveday hashtag during the pre-launch rally and on social media. Once you load hashtag (or other item), you can then go into the Keyhole platform and see a great swathe of data. You can also see the top posts, allowing you to interact with the posting, most influential posters, and most recent. This gives you an all-in-one-spot way to like, comment on and interact with every single post in which users share the hashtag. Additional views are also available. If you want to prioritize your interaction with those posters who are most influential, using the Influential view gives you a quick feed of those impacting the largest number of people with their post(s) using the hashtag. And a full media view is also a feature. Use this software to start leveraging and interacting with important hashtags, keywords, sister accounts and more.